One of the coolest things to do around Christmas here in Birmingham is to visit the Arlington House on Cotton Avenue on the Birmingham’s West Side. 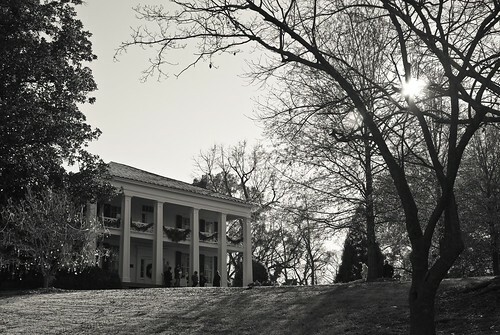 The house is a Greek Revival style Antebellum era mansion currently owned and operated by the City of Birmingham. The house and its beautiful grounds were added to the National Register of Historic Places in 1970. Each year the Arlington house hosts a Christmas tour day where you and your family can tour the house and enjoy free hors d’oeuvres and hot cider in the tea room while watching old school Christmas entertainment and music. This year the entertainment was a trio of harmonica players. These guys played some great traditional pop standards and Christmas songs as a myriad of guests looked on. NOTE: Check out the rest of the images in The Gallery to see for yourself. After that you can self tour the grounds and there are a few local historians ready to give you details about the rich history of the house and of the Elyton area. Arlington has a gift shop and also accepts donations all of which go towards the upkeep of the property as well as hosting free events like this one (that are open to the public). If you can’t make it this year, be sure to put in on your calendar for next year. It’s well worth it to see some of Birmingham’s history preserved here.